Dad got him on checkers last month, planning to hold off on the chess he was eager to teach. Checkers would lay the foundation. But, enchanted by the glass knight, Tennyson started asking and asking to learn chess. “Mom, let’s play chess,” he’s asked numerous times, hooked. I managed to provide plausible reasons why it wasn’t the best time. Or offer Daddy up in my stead. One particular morning last week, I came clean. I always have freely admitted to him things I don’t know (let’s look it up) or am not good at (now DADDY’s talented at that). But curiously, embarrassment the size of a micron weighed on my ego in the confession. So I asked my son to teach me. Not only so he could feel that Mom was connecting, entering his world; but so he would internalize the rules and strategizing in the coaching. Of course I sound the braggart mom: I was surprised at how good a teacher he was. After explaining who’s who and how each piece moves, Tennyson encouraged me to try each out. Earlier that morning I had been eyeing the chance to hunker down and get to the workbooks in math, sight words, and reading so I could in happy conscience have my student color in the little attendance box that attests we did “school” that day. It’s a well-worn tune. Home educators know learning is so much more than those books or the completed checklist, but what is so darn comforting about these things? The morning instead detoured to the Barney in Spanish that’s been partly responsible for the recent stream of Latin American songs and numbers out of the little guy’s mouth. Then came the chess. He at one point changed his mind and decided not to eat my Pawn – to keep his King from being taken by mine. “Let me THINK. Let me THINK…” he determined, poised over the board. Yeah, Mom. Let him think. “You’re doing so great with him, honey,” I commended Daddy yesterday. A recent match: Daddy realized it was Checkmate. He had no moves left. His son had won. 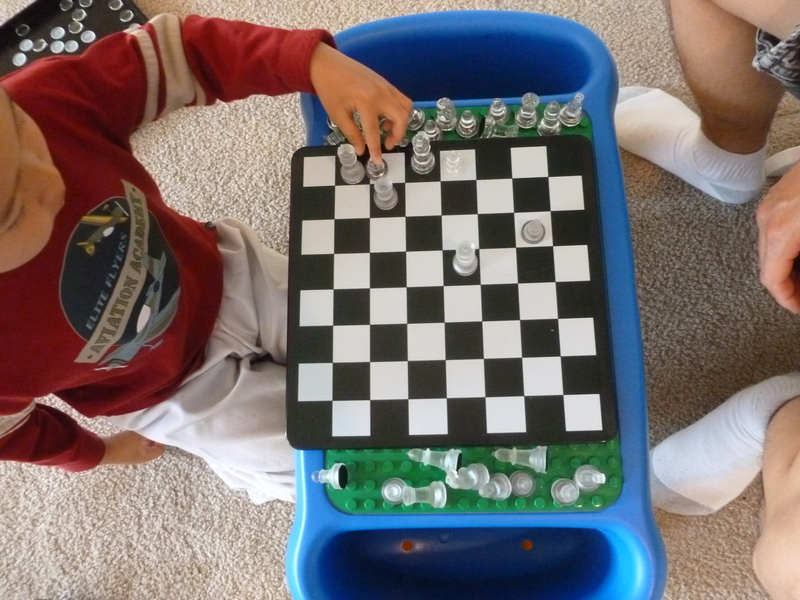 This entry was posted in Learning and tagged Chess, Homeschool, Learning. Bookmark the permalink.